After months of preperation we managed to realize this symbolic project in Monument Valley. It could only work out because so many individuals from US and Germany worked “Wunderbar together” towards a common goal - as the official claim of the “German Year in the USA” goes. Get a personal insight into the athletes’ experiences by reading Niklas report below. 25th October, 2018. Monument Valley, Utah. The alarm rings at 4:30 AM. Monument valley, with its unique red sandstone formations, lies quietly in front of us, still cloaked in darkness. Occasional patches of fog pass us by as, on the horizon, hints of the first light of day appear. The weather forecast promises optimal conditions, news all of us had been hoping for, after the past five days of canceling over and over again, due to difficult – even impossible conditions. A day like today was made for our event, which took several months to plan, and is probably the only day, on which such a challenging stunt could succeed. The excitement within the team is palpable, but the exhaustion sits deep in our bones, the last few weeks have been intense. With five vehicles packed with equipment we drive towards our starting point at the hangar, where, still in the dark, the balloons are unpacked and unfolded in order for the ventilator to fill them with 120,000 cubic feet of air. Carefully, the first flames are fired into the balloons. The two gigantic flags lay next to each other on the red desert sand, like two slumbering giants that grow taller and taller as the hot air pours in. While the balloons are still hovering barely above the ground the slackline is attached to the baskets. Right now, I am still calm and relaxed, my motivation grows as I look over the endless expanse in which, in the light of the full moon, the rocky towers are visible on the horizon. I put on my parachute, the pilots and camera teams are also ready for take-off. We are all waiting expectantly for the daylight to appear, only the even noise of the firing of the flames in the balloon envelope pierces the morning calm. Tim and Zac, our American balloon pilots, give the command for take-off. And here we go: the lines are let loose and the pilots bring the burner to full power. At a rate of 1 meter per second the glowing giants rise with us through a cloudless dawn sky. The wind can barely be felt, but it nevertheless causes us to move slightly laterally during our ascent. The ground moves further and further away beneath our feet. After a good half-hour, we arrive at about 500 meters, the pilots try to keep the balloons steady on the same level, but they continue to turn regularly around their shared axis nevertheless. As the sun rises and it gets bright around us, I begin to realize, that the moment is about to arrive. The gleaming sunlight encircles the rocky peaks and illuminates Monument Valley in a fiery red. The buttes, Three Sisters and Totem Pole cast long shadows into the arid desert landscape – a picture for the Gods. Now the excitement really sets in, I notice that I’ve started shaking and that I’m no longer as calm as I was just a few minutes ago, which will surely not be of help to me when I walk over the line. From the distance the helicopter can already be heard, it moves around us in large circles, the first moments are captured by the cameras and the last communications are made via walkie-talkie. Everyone is in position; the moment has come. 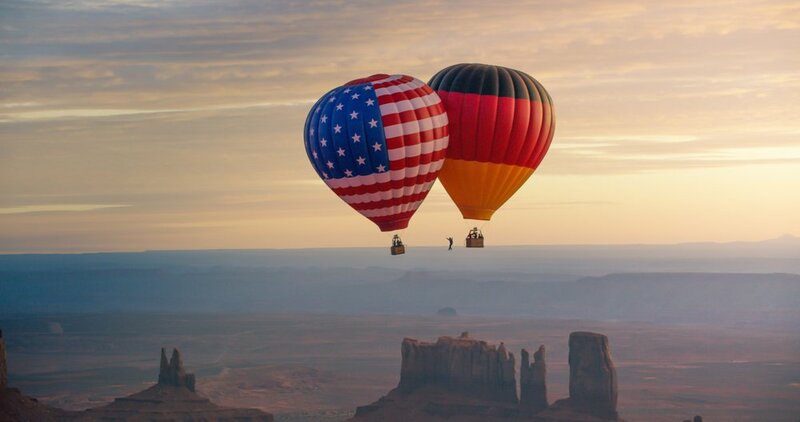 I exchange some final glances with my team, check my parachute and swing myself over the edge of the German balloon’s basket onto the line – in the depths below us lies the Navajo Nation Reservation. Slowly I scoot forward into a seated starting position, the balloons are relatively calm. Fairly quickly I gather myself to dare my first attempt. I breathe in deeply and put one foot in front of the other. Only 10 meters to the American balloon. As I stand, I notice that the line has very little tension and is unexpectedly wobbly. Doubts assail me, whether I could manage to grab the line should I fall. Thoughts that force me to catch fairly quickly. The second attempt I somehow seem to have forgotten already. The show must go on; everyone is tensely waiting for me, my team up here in the air, as well as those down in the valley. For the third time, I position myself for a seated start. Focus. Then I stand up, play with my balance. I feel how the line wobbles beneath me and how the balloons simultaneously turn on their axis. With every step, I feel more secure. Almost automatically, I place one foot in front of the other. It is more difficult to walk than expected, like walking a rodeo-line. The chance to fall off at any moment seems rather large. The insecurities about being able to catch on time and all my other doubts resurface. To not make it across would be devastating, so much energy was put into this project over the last months. I try to block these thoughts out and just keep walking. Persevere, only a few more steps to the American balloon. 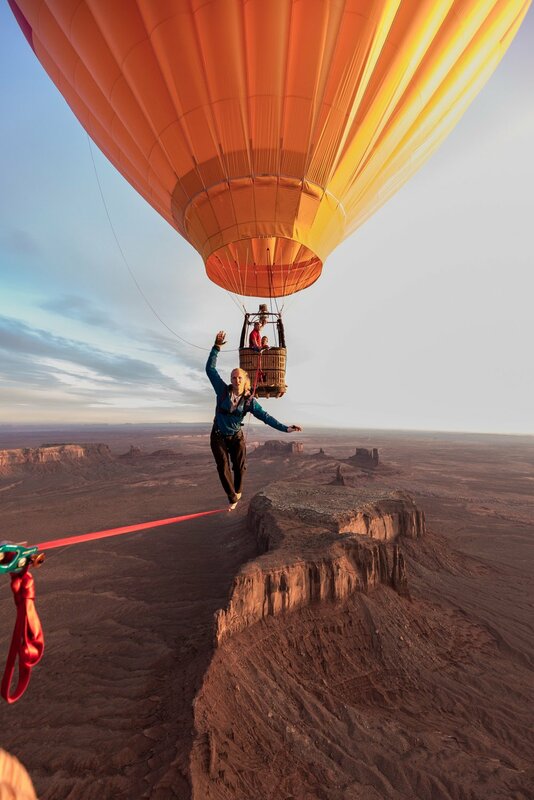 On the last meter, I jump towards the basket, I hang on the edge of the balloon, the whole situation is very intense, that is the only thing I remember clearly – everyone is holding their breath. I pull myself into the basket, the camera team claps me on the shoulder. We climb up higher into the sky, the air feels more turbulent and we seem to be constantly turning in circles. Once at 1500 meters, it is time for an attempt at the world record. I am still so full of adrenaline and electrified by the last attempt, during which I mobilized all my reserves and fought. Everyone is talking me up. They try to take the pressure off of me, which is anything but easy, at a height of 1500 meters with two camera teams plus helicopter crew. All eyes are on me, the expectations are high, the pressure is indescribable. After gathering myself for a short moment, I slide onto the line once more. We are running out of time, the gas in the bottles won’t last for much longer. Tim, our balloon pilot, insists on descending and landing soon. With all the adrenaline, I barely feel the cold on my naked feet. I breathe in deeply once again and set one foot in front of the other. The last chance for the world record. With every attempt at standing up I can hardly lift up my foot, my knees are completely weak, I’m trembling, I just can’t calm down anymore. Once more I pull myself together, focus and push myself upwards to stand. But, as expected, I quickly lose control over my balance, I’m thrown back with my entire body, downwards into a quick rotation, the line shoots past me. I’m falling. After a few somersaults I gain back some control, decelerate, and open my parachute. I forget time and space and can finally enjoy. Two, three minutes, I don’t know how long, I fly over the red desert landscape, past the sandstone formations of the Tribal Park, where I gently land on a patch of sandy earth. My entire body is shaking, a sensation that probably lasts another 20 minutes because of how intense everything feels. I feel alive, indescribably happy. Unforgettable and beyond comparable with any previous undertaking. Definitively one of the most special days of my life.